I have called my collection of texts the "Guillaumin Library of Classical Liberal and Radical Thought" in honour of the 19th century bookseller and publisher Gilbert-Urbain Guillaumin (1801-64) whose bookshop and publishing firm was the focal point for the liberal movement for nearly three quarters of a century. As an "intellectual entrepreneur" he facilitated the development of the movement through the publication of journals, encyclopedias, and scores upon scores of books. The building which housed his publishing firm was also the meeting place for the Society of Political Economists which welcomed academic economists, people in law, politics and business, and the steady stream of visitors who came to one of the most important European capitals in the 19th century. The books which Guillaumin published were in many cases original pieces of research on all aspects of theroretical, historical, and contemporary political economy. He also fostered the republication or translation of classic works from the 17th and 18th centuries, especially the works of the Physiocrats, Smith and Ricardo, and J.B. Say. It is thus in the spirit of Guillaumin that we offer this collection of classics from a previous age. Recently added titles (by year). These works are in the public domain and have been only slightly edited to make them more user-friendly. They have all been checked to identify missing pages (much of the scaning to PDF was done poorly and it is common for two pages of text to be missed by careless page turning), to remove pictures of numerous fingers, hands, and even feet of the scanners, and other such improvements. As an historian interested in the classical liberal tradition I have chosen to put online the works in facsimile PDF format and in the original language in which they appeared. I have indicated where pages are missing from the original or if volumes in a series are missing. With journals, such as the Journal des Économistes, I have amalgamated the tables of contents from each volume into one sinlge file (e.g. the Second Series which appeared between 1854-1865) to aid searching for material. For some authors (e.g. Molinari, Come, and Dunoyer) have have included more detailed but still incomplete bibliographies of their works with links to those works which I have been able to find in electronic format. Please remember that this is a "work in progress" and will be added to as I find the time. Title: Say, Jean-Baptise, Cours complet d'économie politique pratique; ouvrage destiné à mettre sous les yeux des hommes d'état, des propriétaires fonciers et les capitalistes, des savans, des agriculteurs, des manufacturiers, des négocians, et en général de tous les citoyens, l'économie des sociétés (Paris: Rapilly, 1828-9), 6 vols. Comment: This important work by Say has never been translated into English. 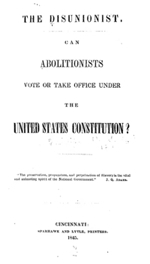 Title: Wendell Phillips, The Disunionist, Can Abolitionists vote or take Office under the United States Constitution? (Cincinnati: Sparhawk and Lytle, Printers, 1845). Comment: A foundational text for the "voluntaryists" who think it is immoral to vote or to sweath an oath to take office in government. Title: Le Libre-Échange. Journal du travail agricole, industriel et commercial. Première année, No. 1: 29 novembre 1846; No. 52: 21 novembre 1847. And Le Libre-Échange. Deuxième année, No. 1: 28 novembre 1848; No. 20: 16 avril 1848. Edited by Frédéric Bastiat and Charles Coquelin. E-Text: 52 issues of the first year and 20 issues of the second year are available in facsimile PDF. [Orignally scanned 2 pages to a page - now reformatted to one page per page]. Comment:The last issue edited by FB was No. 12: 13 février 1848. Subsequent issues were edited by Charles Coquelin as Bastiat became increasingly busy during the revolution, editing and distributing the little magazine La République française and then standing for the April elections to the Constituent Assembly (which he won representing his home district of Les Landes). 22. 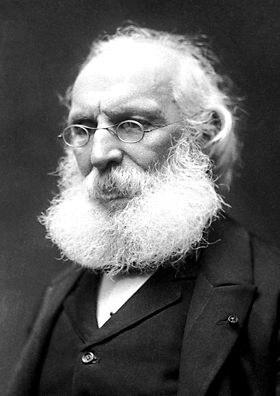 Oct. 28: Le Travail intellectuel (1847-48). Title: Le Travail intellectuel. Journal des intérêts scientifiques, littéraires et artistiques (Paris) 15 Aug. 1847 - 15 Feb. 1848 (7 issues). Rédacteur en chef: Hippolyte Castille, rue Saint-Lazare 79. Comment: A short lived journal founded by H. Castille and his economist friends such as Bastiat, Molinari, and others. It was designed to defend the idea of the perpetual property rights in ideas. The address of the editorial offices, rue Saint-Lazare 79, was Castille's home where he held a salon. This is where Molinari got the idea for the title of his book Les Soirées de la rue Saint-Lazare (1849). 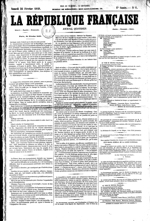 Page 1 of issue no. 1 is missing. 21. Oct. 26: Frederick Douglass, Oration (July 5th, 1852). 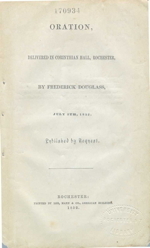 Title:Oration, Delivered in Corinthian Hall, Rochester, by Frederick Douglass, July 5th, 1852 (Rochester: Printed by Lee, Mann, and Co., American Building, 1852). E-Text: The speech is available in HTML and facs. PDF 3.9 MB. Comment: Fredercik Douglass is a little appreciated classical liberal who based his defence of freedom solidly on the grounds of self-ownership and the renunciation of corecion. He believed these were universal principles which applied to both African-Americans and women. 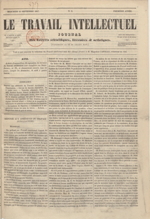 Title: Laissons Faire: Revue des économistes français (revue mensuelle de l’Institut Coppet). Rédacteur en chef : Benoît Malbranque, chercheur-associé, vice-président de l’Institut Coppet. Éditeur : Damien Theillier, président de l’Institut Coppet, professeur de philosophie. David M. Hart, Membre du Comité d’honneur. E-Text: <http://www.institutcoppet.org/laissons-faire/archives/> or here [complete backlist with ToC]. Comment: The French classical liberal tradition is alive and flourishing in Paris. The Institut Coppet (named after madame de Staël's château in Switzerland where classical liberals could seek shelter from the wrath of Napoléon) is undertaking a large republishing effort to bring back into print the French classics from the 18th and 19th century. This is their monthly journal. E-Text: 52 issues of the first year and 20 issues of the second year are available in facsimile PDF. Title: La République française. Daily journal. Signed: the editors: F. Bastiat, Hippolyte Castille, Molinari. Appeared 26 February to 28 March. 30 issues. E-Text: 28 of the 30 issues are available in PDF. Comment: The day after the July Monarchy collapsed in late February Bastiat, Molinari, and Castille were on the streets of Paris with their own revolutionary magazine advocating free market ideas to the rioters in the streets. This is a fascinating piece of liberal history. 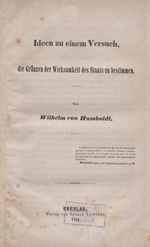 Title: Wilhelm von Humboldt, Ideen zu einem Versuch, die Gränzen der Wirksamkeit des Staats zu bestimmen (Some Ideas in an Attempt to determine the Limits of the Functions of the State) (Breslau: Heinrich Richte, 1851). Comment: Humboldt's essay on "The Limits of State Action" is an early effort to define the boundaries of the limited classical liberal state. He wrote this as a series of essays in 1792 during the French Revolution a couple of which were published at the time. He did not publish the compelte book in his lifetime, perhaps fearing how radical it was now that he had become a seniour public servant in the Prussian education system. It was published in 1851 in German and was quickly translated into English in 1854, just in time to have an impact on John Stuart Mill who acknowledged Humboldt's influence on his thinking in On Liberty which was published in 1859. 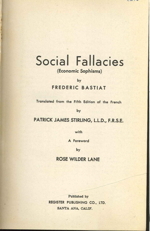 Title: Social Fallacies (Economic Sophisms) by Frederic Bastiat. Translated from the Fifth Edition of the French by Patrick James Stirling, L.L.D., F.R.S.E. with A Foreword by Rose Wilder Lane (Published by Register Publishing Co., Santa Ana. Calif. 1944). Comment: Rose Wilder Lane (1886-1968) was an American individualist and libertarian who was very important in the founding of the modern American libertarian movement in the mid-20th century. Lane wrote The Discovery of Freedom in 1943 and the following year this Preface for R.C. Hoiles' edition of Bastiat's Social Fallacies (Economic Sophisms). This was an important moment when Bastiat's free trade and free market ideas were re-introduced to America. In her foreword Lane provides a remarkable survey of the rise and fall and possible rise of liberty again over the previous 200 hundred years, and placed the work of Bastiat in the context of this historical movement. 15. August 14: Frédéric Bastiat, Harmonies of Political Economy, trans. Stirling (1880). Title: Harmonies of Political Economy, by Frédéric Bastiat. Translated from the Third Edition of the French, with a Notice of the Life and Writings of the Author. Second Edition (Edinburgh: Oliver and Boyd, 1880). E-Text: Facimile of the 1880 vesion [PDF 12.2 MB] and an HTML version with links to earlier versions in facsimile. Comment: The first complete English edition of Bastiat's Economic Harmonies (1880). James Patrick Stirling translated the 1st ed. 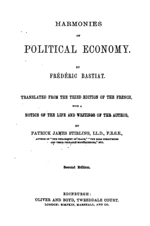 of Economic Harmonies in 1860 (the 1st 10 chapters of Bastiat's unfinished work appeared in Jan. 1850), the 2nd French edition of 1851 with 15 additional chapters from his papers and drafts which Stirling translated and published in 1870, and then this 1880 edition of the complete volume. 14. 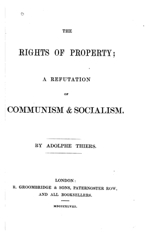 August 10: Adolphe Thiers, The Rights of Property; A Refutation of Communism and Socialism (1848). Title: Adolphe Thiers, The Rights of Property; A Refutation of Communism and Socialism [no name given for the translator] (London: R. Groombridge & Sons, 1848). Comment: The attempt by the socialists in the Provisional Government after the February Revolution of 1848 in France led to a vigorous discussion about property rights and socialism when the socialists tried to enshrine a "right to a job" clause in the new constitution. Liberals like Bastiat and Molinari wrote pamphlets and books defending property and criticising socialism, as did liberal conservatives like the historian and politician Adolphe Thiers. In this book Thiers gives a very interesting defence of the right of self-ownership which is aLockean notion. 13. August 3: Yves Guyot, Le Libre-Échange international (1918). Title: Le Libre-Échange international. Six Conférences organisées en 1918 par la Ligue du Libre-Échange à l'École des Hautes Études Sociales par MM. Yves Guyot, Germain Paturel, G. Schelle, J. Pierson, Frédéric Mathews (Paris: Félix Alcan, 1918). Comment: In 1911 the remnant of the French free traders formed a new Free Trade Association modelled on Bastiat's of 1846. Yves Guyot, the editor of the Journal des Économistes, was the President and their Manifesto was published there in 1911. A second Manifesto was published during WW1 in 1916 and a conference organised in January 1918 in order to assess the prospects for free trade as the war came to a conclusion. Guyot was not optimistic as he observed that when businessmen and financiers advise and cooperate with governments in the conduct of the war they become more interventionist than the careeer bureaucrats. He noted the existence of a stark antithesis between the interventionist and militarist oligarchies which controlled the governments on both sides and the supporters of free trade who wanted to destroy the power of these oligarchies by introducing a policy of international free trade (pp. 34-35). 12. July 29: Bastiat, Molinari, et al., Jacques Bonhomme (June, 1848). Title: Jacques Bonhomme, (Paris: 11 June - 13 July, 1848). 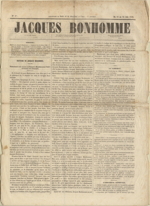 Comment: Jacques Bonhomme was a short lived journal which was written and distributed on the streets of Paris during the 1848 Revolution by 4 economists, Gustave de Molinari, Charles Coquelin, Alcide Fonteyraud, and Joseph Garnier. It appeared approximately weekly with 4 issues between 11 June to 13 July. It was forced to close by the violent repression by the army of the 'June Days' uprising. 11. 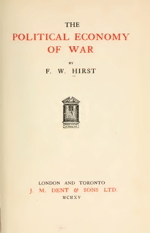 July 20: Francis W. Hirst, The Political Economy of War (1915). Comment: Francis Hirst (1873-1953) was an English classical liberal author and book editor who was the editor of The Economist from 1907 to 1916. He wrote biographies of William Gladstone, Adam Smith, and John Morley and many books on economics. While editor of the Economist he published the first book devoted to the "political economy of war" which drew upon the ideas of Adam Smith and Frédéric Bastiat. 10. July 20: Poems by Wilred Owen (1921). 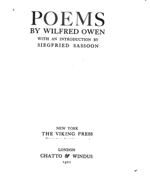 Title: Poems by Wilred Owen, with an Introduction by Siegfried Sassoon (New York: The Viking Press; London: Chatto & Windus, 1921). Comment: Wilfred Owen is the best known of the English war poets who fought in WW1. He died on 4 November 1918 one week before the Armistice ended the war. This collection of his war poerty was published by friend Siegfried Sassoon who was also a poet. My favourites in this volume are "Parable of the Old Men and the Young" and "Dulce et Decorum est". His unfinished preface is also very moving. 9. July 19: Jean de Bloch, The Future of War (1903). 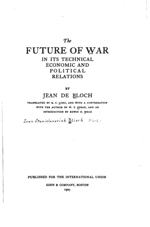 Title: Jean de Bloch, The Future of War in its Technical, Economics, and Political Relations. Translated by R.C. Long, and with a Conversations with the Author by W.T. Stead, and an Introduction by Edwin D. Mead (Boston: Published for the International Union, Ginn and Company, 1903). Comment: This is the 1 vol. abridgement of his 6 vol. work originally published in Russian and German in 1899. 8. July 19: Johann von Bloch (Jean de Bloch), Der Krieg (6 vols.) (1899). 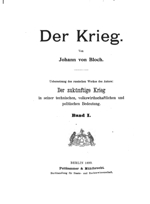 Title: Johann von Bloch (Jean de Bloch), Der Krieg. Uebersetzung des russischen werkes des Autors: Der zukünftige krieg in seiner technischen, volkswirtschaftlichen und politischen Bedeutung (Berlin: Puttkammer & Mühlbrecht, 1899). Comment: Jean de Bloch (1836-1902) was a Polish born banker and railway financier who lived and worked in Russia. The quick Prussian defeat of France in 1870 led him to pursue a scientific study of what a modern war might look like in the near future. This 6 volume work is remarkably prescient in many of his predictions of what actually transpired in WW1 . A 1 vol. abridgement was published in English and a 4 vol. one in French. The Germans got the full 6 vol. treament but ignored it. The graphs and statistical tables about the destructiveness of modern weaponry and his predicted death rates are especially interesting. 7. 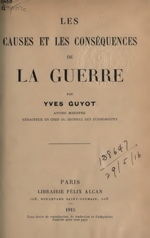 July 17: Yves Guyot, Les Causes et les conséquences de la Guerre (1915). Title: Yves Guyot, Les Causes et les conséquences de la Guerre. 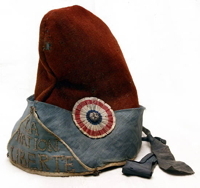 (Paris: Félix Alcan, 1915). Comment: Guyot wrote a series of 9 aticles for the Journal des Économistes (of which he was the editor) as the war was unfolding between August 1914 and April 1915 [French version [PDF 16MB]. This was expanded and published as a book which was translated into English. It provides an interesting insight into the minds of the last remaining classical liberals in France before they were marginalised after the war. 6. 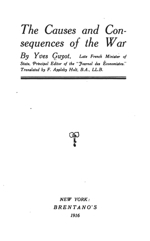 July 16: Yves Guyot, The Causes and Consequences of the War (1916). Title: Yves Guyot, The Causes and Consequences of the War. By Yves Guyot, Late French Minister of State. Principle Editor of the "Journal des Économistes." Translated by F. Appleby Holt, B.A., LL.B. (New York: Brentanbo's, 1916). 5. 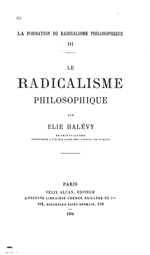 July 14: Élie Halévy, La Formation du Radicalisme philosophique III: Le Radicalisme philosophique (1904). Title: Élie Halévy, La Formation du Radicalisme philosophique III: Le Radicalisme philosophique (Paris: AF. Alcan, 1904). Comment: The third volulme of a three volume work on the movement for liberal reform in England, known as the Philosophic Radicals, in last part of the 18th century and the first 3 decades of the 19th. 4. July 14: Élie Halévy, La Formation du Radicalisme philosophique II: L'Évolution de la doctrine utilitaire de 1789 à 1815 (1901). 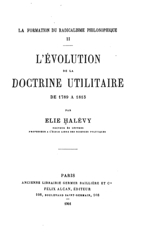 Title: Élie Halévy, La Formation du Radicalisme philosophique II: L'Évolution de la doctrine utilitaire de 1789 à 1815 (Paris: F. Alcan, 1901). Comment: The second volulme of a three volume work on the movement for liberal reform in England, known as the Philosophic Radicals, in last part of the 18th century and the first 3 decades of the 19th. 3. 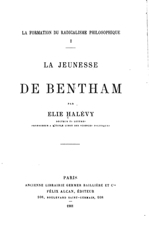 July 14: Élie Halévy, La Formation du Radicalisme philosophique I: La jeunesse de Bentham (1901). Title: Élie Halévy, La Formation du Radicalisme philosophique I: La jeunesse de Bentham (Paris: F. Alcan, 1901). Comment: The first volulme of a three volume work on the movement for liberal reform in England, known as the Philosophic Radicals, in last part of the 18th century and the first 3 decades of the 19th. 2. July 14: Élie Halévy, Thomas Hodgskin (1787-1869) (1903). 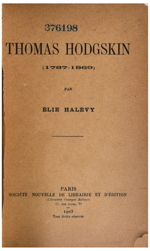 Title: Élie Halévy, Thomas Hodgskin (1787-1869) (Paris: Société Nouvelle de librairie et d'édition, 1903). Comment: The first biography of the life and thought of Hodgskin was written by a Frenchman who also wrote an imporatnt 3 volulme history of the Philosiophic Radicals who were influenced by Bentham's theories, most notably James and John Stuart Mill. 1. July 13: Thomas Hodgskin, Labour Defended against the Claims of Capital (1825). 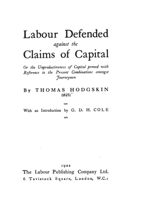 Title: Thomas Hodgskin, Labour Defended against the Claims of Capital. Or the Unproductiveness of Capital proved with reference to the present Combinations amongst Journeymen. With an Introduction by G.D.H. Cole (London: The Labour Publishing Company Ltd., 1825). Comment: Claimed by many socialists as "one of them" Hodgskin is in fact a radical individualist and supporter of free trade and free markets. 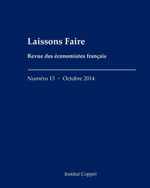 October 6: A colour version of Bastiat's pamphlet La Loi (1850) [PDF 18.2 MB]. October 6: A very early work by Molinari: Gustave de Molinari, Biographie politique de M. A. de Lamartine. Extrait de la Revue générale biographique, politique et littéraire, publiée sous la direction de M. E. Pascallet. Deuxième Edition (Paris: Impr. de Mme Lacombe, 1843). [PDF 4 MB]. October 6: Gustave de Molinari, Le Congrès européen (Bruxelles: A. Lacroix, Verboeckhoven et Cie, 1864). [PDF 1.9 MB]. 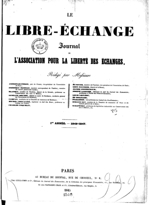 October 6: I have found and downloaded but not yet edited the 5th Series of the Journal des Économistes (1890-1903) and most of the 6th Series (1904-1920). These will also have an HTML ToC. [Watch this space!] Molinari was the editor from 1881 to 1907. The issues covering the First World War will be especially interesting as the 100th anniversary of the start of WW1 is next year. October 6: I finally found a digital copy of Molinari's book on Bonapartist despotism: Les révolutions et le despotisme, envisagés au point de vue des intérêts matériels, précédé d'une lettre à M. le comte J. Arrivabene, sur les dangers de la situation présente (1852). [PDF 23.4 MB] There is some good material here on Molinari's class anaysis of "the tax payers" and "the tax eaters". July 28: Lysander Spooner's great essay on the injustice of so-called "victimless crimes" was originally published anonymously in Dio Lewis, Prohibition a Failure: or, the True Solution of the Temperance Question (Boston: James R. Good and Co., 1875) [PDF 5.8 MB]. See Spooner's essay "Vices are not Crimes. A Vindication of Moral Liberty", pp. 107-46 [PDF 1.1 MB]. July 28: A facsimile copy of Edmund Burke's Vindication of Natural Society (1756) [PDF 3 MB]. Rothbard thought this was a piece of youthful radicalism before Burke went conservative; others think it is a satire showing the absurdities to which the freedom principle might take you if you weren't creful. July 28: The Institut Coppet in Paris is doing great things to revive interest in the 18th and 19th century French classical liberal tradition. They are republishing some of the classics every week and have a new journal with articles about their great intellectual predecessors. It is called, appropriately "Laissons Faire" [let us freely to go about our business! ], which is a version of the great18th century slogan "Laissez Faire" (leave us free to go about our business!). They have two issues out already: June 2013 [PDF 2.3 MB] and July 2013 [PDF 2.4 MB]. July 28: An update to my annotated anthology of French classical liberal texts (en francais). I have added essays by Bastiat on Republicanism, Dunoyer on the politics of political economy, Molinari's Credo of Liberty, Molinari's pessimism for the future, Molinari's vision of he future, Horace Say on the division of labour, Thierry on"factions" (or class), and the anonymous "T.S." on women's rights. July 27: After a bit of a hiatus we are back to adding material to our collection. We are getting ready to commemorate the 200th anniversary of the founding of Charles Comte and Charles Dunoyer's journal Le Censeur in June/July 1814. We have nearly a complete set of Le Censeur (June/July 1814 - September 1815) and its successor Le Censeur européen (Feb. 1815 - April 1819) and are compiling a complete table of contents with the names of the authors of the articles. Thanks to the Institut Coppet we also have Ephraim Harpaz's history of the journals PDF [9.3 MB] which is essential reading. I also have a new HTML version of my book on Comte and Dunoyer's "Industrialist Theory of History. February 9: The Introduction by Guillaumin and Clément to the Dictionnaire de l'Économie Politique (1853) where they reflect on "The Current State of Political Economy in France" - [PDF 1.5 MB] and HTML. February 6: Thomas Hodgskin's defence of the free market and spontaneous order in an article in The Economist (Sept. 1849) called "Is Laissez-Faire Anarchy?". February 5: The Prospectus and Preliminary Article in the first issue of The Economist magazine (August, 1843). February 5: additional copies of John Wade's Extraordinary Black Book (1828, 1831) and Appendix. February 3: an HTML version of James Mill, "Summary Review of the Conduct and Measures of the Seventh Imperial Parliament" (1826) on the nature of "aristocratical government". And Vilfredo Pareto, "Un' applicazione di teorie sociologiche," (1900) trans. in English as The Rise and Fall of the Elites. [PDF 3.8 MB]. February 2: a new section of Classic Works on Libertarian Class Analysis with Gaetano Mosca, The Ruling Class (English and Italian), Franz Oppenheimer, Der Staat, and Randolph Bourne, The State (1918). Also the 1950 edition of Albert Jay Nock, Our Enemy, the State (1935). This year is the 40th anniversary of Walter Grinder's edition of Nock's classic work published by Free Life Editions in 1973. February 1: added an HTML version of James Mill's Encyclopedia Britannica article on "Caste" (1824). January 30: Added many books, articles and essays by James Mill, including essays from the Encyclopaedia Britannica, the Westminster Review, and the London Review. I am compiling an anthology of his "Political Essays and Reviews, 1815-1836". January 27: added the 1st edition of Bastiat's Ce qu'on voit et ce qu'on ne voit pas, ou l'Économie politique en une leçon (Paris: Guillaumin, 1850). [PDF 1.49 MB]. January 27: added Percy Bysshe Shelley, A Philosophical View of Reform (1820) in HTML and PDF. January 14: I have reorganised the file structure of the site. The home page is now <davidmhart.com/liberty>. I have also gathered together all the Bastiat resources on one page here <davidmhart.com/liberty/Bastiat>. January 13: I have also been sending French language material to the Institut Coppet in Paris to add to their growing library of material on the French classical liberal tradition (so far stuff by Molinari, Bastiat, Thierry). January 13: J.B. Say's curious "utopian" vision of a society based upon free market principles - Olbie (1800) [in both facsimile PDF and HTML]. January 12: The manuscript of our French language anthology of 19th century French classical liberal thought has been submitted to the publisher Ellipses. It was heavily edited for reasons of length! January 8: A list of the articles in Le Censeur européen (1817-19) written by Charles Dunoyer. January 6, 2013: an interesting short article on classes ("les factions") from 1817: "T.", "Des Factions" Le Censeur européen, Tome 3 (1817), pp. 1-8. January 6, 2013: A full table of contents of Comte and Dunoyer's journal Le Censeur européen (1817-1819) is now in HTML format with author's name where available. December 6: the final volume (7) of Le Censeur from September 1815 which was confiscated by the censors and is therefore hard to come by. This copy has some pages missing at the end. See Comte's bibliography. December 6: several volumes of material by Charles Dunoyer: Oeuvres de Dunoyer, 3 vols. (vol. 3 contains an important collection of his articles); Le Second Empire et une nouvelle restauration (1864-65), 2 vols; La Révolution du 24 Février (1849). See his bibliography page. December 5: I have added some more French language material: a collection of articles Bastiat wrote for the revolutionary magazines La République française (Feb-Mar 1848) and Jacques Bonhomme (June 1848) taken from the Oeuvres complètes; part of the dialogue between the Economist and his rivals in Conversations sure les grains (1886) which reveals Moilinari's growing pessimism. November 26: in preparation for a conference on Molinari I have added 8 new titles and 4 corrected or complete titles to the bibliography. Note: intro to Contes choisis sur l'économie politique, par Miss Harriet Martineau (1881); De l'enseignement obligatoire. Discussion entre G. de Molinari et Frédéric Passy (1859); Lettres sur la Russie (1st edition 1861), 2nd edition (1877); Le Mouvement socialiste et les réunions publiques avant la révolution du 4 septembre 1870 (1872); Questions économiques à l'ordre du jour (1906). 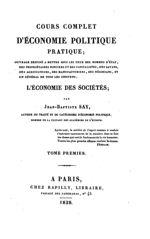 November 22: the 1st edition of Say's Traité d'économie politique (1803), the 3rd edition of his Cours complet (1852), and an HTML version of the 6th edition of his Traité (1841) [1.6 MB]. [See Say bibliography page for details]. July 12: Complete set of Otto Dix's drawings of WW1, Der Krieg (1924). July 1: The ANZAC Book (1916) [PDF 15.3 MB] which contains drawings, poems and articles written by Australian and NewZealand troops at Gallipoli in November 1915. I discuss these poems and drawings in several postings at my blog. "An ANZAC Alphabet" is one of the better known pieces. June 29: Google Books keeps adding new material so you have to keep an eye out for recent additions. This original edition of Bastiat's The Law was posted late last year: La Loi (Paris: Guillaumin, 1850). [PDF 1.7 MB]. Highly recommended is this charming abbreviated and illustrated version of The Law [Bastiat for Dummies?] published by FEE in the late 1940s as part of their rehabilitation of Bastiat in America [PDF 3.1 MB]. See my blog for a discussion of the illustrations. As a companion piece to the illustrated Bastiat I have also added the illustrated ("cartoon") version of Hayek's The Road to Serfdom (1945). June 28: a collection of 15 titles published by Guillaumin between 1840 and 1848 called the Collection des principaux économistes [A Collection of the Principal Works of Economics] in which the economists asserted their intellectual heritage going back to the early 18th century. Interestingly the first volume to appear was Say's Cours complet from the late 1820s. June 22-23: I have added new books by Constant, Béranger, Destutt de Tracy, Staël, Stendhal, Tocqueville, Beaumont, Schoelcher, Bastiat, and many others. 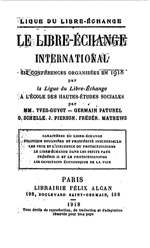 See the main bibliography on 19th Century French Classical Liberalism. June 16: as I have been working on the French language edition of our anthology of 19th century French classical liberal thought ("The Golden Age of French CL Thought") I have been gathering scores of new books which I want to put online. I thought I would begin with the 1st part of Molinari's work of historical sociology on "The Evolution of Economic and Political Liberty". Part 2 has been online for a while [L'évolution politique et la révolution (1884)] and I have just added Part 1 [ L'évolution économique du XIXe siècle: théorie du progrès (1880)]. See the Molinari bibliography. 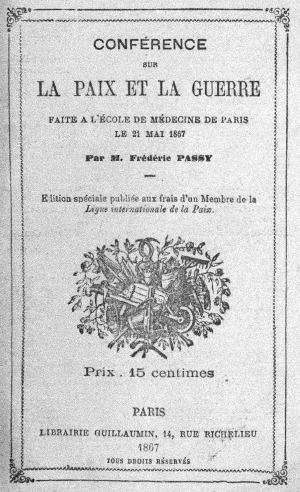 May 20: one of the greatest anti-war speeches ever given was by Frédéric Passy (1822-1912) in Paris in 1867. Online here in French. May 17: first draft of Molinari's Soirées is online at the OLL [comments welcome!]. Table of Contents here at this site. April 28: ANZAC Day address to the Indy Aussies. March 25: a translation of Molinari on"Ulcerous Government"
March 23: a new French edition of Les Soirées. November 6: Obituary by Yves Guyot [JDE, Febraury 1912]. October 27: David Boaz, "The Roots of Libertarianism." October 26: the video of my talk at the Cato Book Forum on Bastiat vol. 1 has been posted at the Cato Institute website. October 8: the complete Report of the Proceedings of the Second General Peace Congress, held in Paris, on the 22nd, 23rd and 24th of August, 1849, with speeches by Bastiat and Cobden. Also French version. October 6: Bastiat's Speech to the Second General Peace Congress in Paris 22-24 August, 1850 - [HTML] and [PDF]. August 7: A revised and corrected version of my paper on Bastiat's Economic Sophisms paper is available in HTM format. June 15: a paper given at the History of Economic Thought Society of Australia (HETSA) - "Frédéric Bastiat’s Rhetoric of Liberty in the Economic Sophisms (1846-1850)." June 11-12, 2011: new look website design for a new hosting service at davidmhart.com. All pages now have a standard banner an drop down menus for navigation. June 5: bio & collected works of Marquis de Condorcet (1743-1794).